Grand Theft Auto 2 is an open-world action/adventure game developed by DMA Design that is the follow-up to the popular and controversial Grand Theft Auto. Released in 1999, it continued the groundbreaking gameplay concepts introduced in the original Grand Theft Auto. Grand Theft Auto 2 uses the same top-down third-person gameplay view that was found in Grand Theft Auto. It also includes a host of new features including seven rival gangs of organized crime including the Yakuza, Scientists, Looneys, Rednecks, Zaibatsu, the Russian Mob and Hare Krishnas. It also introduces the concept of having to earn and losing the respect of gangs by completing various missions they assign or taking a mission that may make another gang unhappy. Missions are accepted in the same manner as other games in the series. Players will receive phone calls from crime bosses on a public pay phone requesting certain jobs or tasks to be performed. Another new feature found in GTA 2 is the enhanced/upgraded law enforcement which can chase players throughout the city and features SWAT teams, special agents, and the army. Grand Theft Auto 2 is also the only Grand Theft Auto game that is set in a city called Anywhere City, USA which is not part of the Grand Theft Auto World that was featured in the original game or Grand Theft Auto III and later. In addition to the main story campaign objectives, Grand Theft Auto 2 includes side quests and work-for-hire jobs that help earn respect and experience for you to climb your way up the ladder of the criminal underworld. Grand Theft Auto 2, along with Grand Theft Auto and Wild Metal were released as registered freeware games a few years ago, meaning you would have to register your email address with Rockstar Games in order to obtain the free download link. Rockstar has since taken down the Rockstar Classics website and has given any timetable for its return. You are however in luck because many third party game hosting websites still offer the game for free download. Rockstar Games did update GTA2 to work on modern PC operating systems so there's no need to run out of a DOS emulator such as DOSBox. In addition to Grand Theft Auto 2, there are eight other games in the Grand Theft Auto series of crime-based video games. 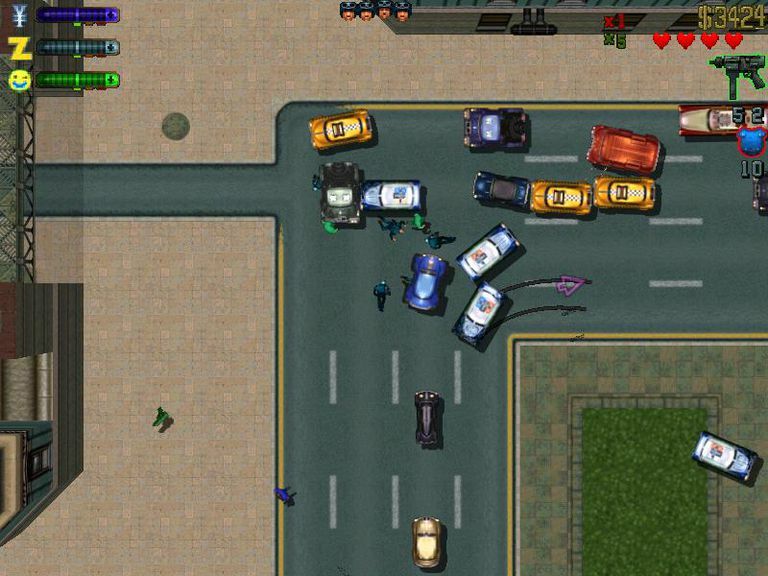 The original Grand Theft Auto and Grand Theft Auto 2 are played from the top-down perspective. Grand Theft Auto III which was returned the series to the game world started in the first game of the series marks a switch from the top down perspective tot eh over the shoulder third person perspective. Every game since then has also been developed in this format with some also containing the first-person point of view gameplay. There are a number of other former commercial video games that have been released as freeware as well as many free to play games that are extremely popular. If you've had fun with Grand Theft Auto 2 and are looking for something new to try out, have a look at those games or the Free Games A to Z list.